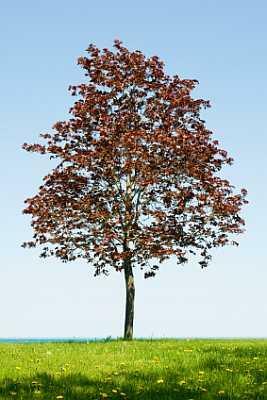 If you are looking to add an extra dimension of color to your summer foliage, the crimson king maple tree can be an excellent choice. A large, dense shade-tree, the crimson king offers rich burgundy foliage all summer long, changing to a brilliant gold for autumn. While it is not perfectly suited to all purposes, the crimson king adds an element of interest to most landscapes and makes a delightful addition to a park or garden. Known scientifically as Acer platanoides, the crimson king is a beautiful, showy specimen - tolerant of a variety of soil and environmental conditions. For this reason, many urban landscapers choose crimson king as a residential street tree. It is, however, possible to overdo this burgundy beauty. Too many of these dark-leaved specimens in a row along a roadside or walkway can be distracting and overwhelming to the eye - resulting in an almost bleak visual effect. Instead, allow this tree to show off its full potential by using it as a stand-alone specimen tree or as a single individual amongst a group of more conventionally-hued species. Another factor to consider when finding the ideal space for a crimson king is the species' notoriously shallow root system. The main roots tend to reside just below the soil surface, occasionally protruding here and there like sea serpents across your lawn. This can make mowing difficult, as the mower blades may damage the roots or vice versa. These structures can also pose a problem if the tree is planted too close to a road or walkway, actually overpowering the cement or asphalt and causing cracks and upswellings along the surface. The crimson king makes an excellent shade tree, usually reaching 35 to 45 feet in height and 25 to 30 feet in breadth, with a dense, symmetrical oval-shaped crown that effectively blocks out sunlight. Branches are mostly upright in growth habit, making them reasonably resistant to damage from ice or snow. This tree is remarkably tolerant of salt in both the soil and the atmosphere, making it an ideal choice for northern regions where road salt may damage roadside plants. When [Maple Tree Planting planting], dig a hole slightly shallower than the root ball, and plant so that roughly one-third of the root ball is raised above level with the grade. Aphids: Signs of this common garden pest include wilted, curling leaves, poor growth and the presence of a sticky substance known as honeydew either on plant parts or on the ground under the tree. Cottony Maple Scale: Look for small, cottony egg sacs, one-quarter to one-half an inch long. Usually kept in check by natural predators, cottony maple scale is in most cases primarily a cosmetic problem. Borers: Borers produce small, rounded holes in tree trunks accompanied by sawdust-like residue. These insects commonly only attack trees already distressed, but may prove fatal to your tree if left untreated. In cases of severe infestations, it may be wise to consult a professional arborist to treat the problem. The crimson king is a lovely, interesting tree sure to become a conversation piece in your yard or garden. Take care with your site selection, and this lovely tree species will bring you nothing but joy for years to come.